Humor and laughter are vital for personal and organizational renewal—a common sense idea that isn’t too common in many workplaces. With this book you will walk the talk and run your fun, reestablishing people connection, perspective, and creativity. The evidence is now in that humor is effective: from management gurus, key top executives, and most importantly from workshop participants in management sessions facilitated by the author. When you were a child you laughed 300 times a day. As an adult you’re lucky to log in ten laughs a day and most of those are not on the job. What happened? 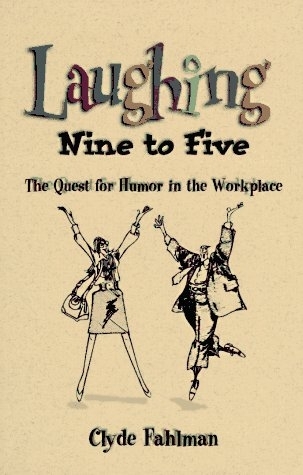 Author Clyde Fahlman explores this process in the book Laughing Nine to Five, showing how organizations and employees can recapture humor. The search is on for humor and laughter in the workplace to facilitate connection, creativity, and perspective. Anecdotes of workshop participants, testimonials from management gurus, and humor formulas adapted to the world of work provide the supporting evidence. Laced with positive suggestions for utilizing humor, the book also includes useful irony and satire. For example, you should be aware that TQM really means Totally Questionable Management. Clyde Fahlman had seventeen different managerial assignments in the Bell System. They were trying to find something he could do when he left. (Note: the seventeen jobs and the “system” no longer exist.) He now teaches management courses in human relations, creativity, and humor in the workplace at colleges in the Portland area. He has crow’s feet around his eyes. Let’s imagine for a moment that you lost your job because of layoffs, re-structuring, the boss’s spouse, or you were just fired. Your organization may have exit interviews. (You can check this out in something called a HR handbook. HR means Human Reductions.) If they do, you can restore your self esteem easily.